* Wa Printing accepts NO responsibility for any copyright issues from the files you upload. 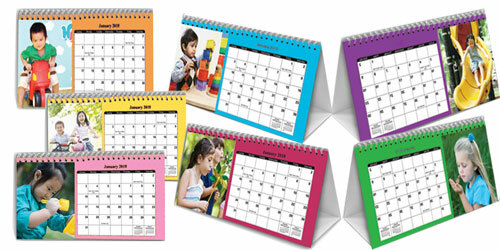 Promote your company all year round with WA PRINTING range of custom printed desk calendars. Perfect for both homes and offices, desk calendars are really wonderful gifts for friends and family. These special calendars are the ultimate promotional tools for a range of marketing purposes. They remain on customers’ desks all the times; constantly reminding them of your business and contact details. With provided space, you can add photos, logos or company contact details for customers. Calendars are printed 300gsm gloss card with our wire bound calendars, including heavy hardboard backings of 500gsm front cover. If you need help and advice please pick up the phone and give us a call today. WA PRINTING service team are happy to assist you in any way.